More show and tell from a charming new addition to knit nights. 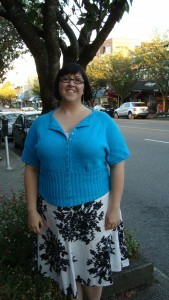 Sheila dropped by a few weeks ago to share in some knitting fun and she was wearing a stunning blue cardigan. It has a lovely shape to it and some pretty cables to keep it fresh. She managed something I have yet to accomplish: a sweater that really fits me well. I find it a challenge to get the shaping just right to maximize flattering effects, well done Sheila! 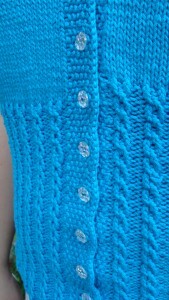 The pattern is Peggy Sue by Linda Wilgus, a spring/summer short sleeved number that Sheila has done in Diamond Yarn Cantata. The yarn is 100% cotton and plied for good wear. This card will definitely make an appearance in springs and summers to come! 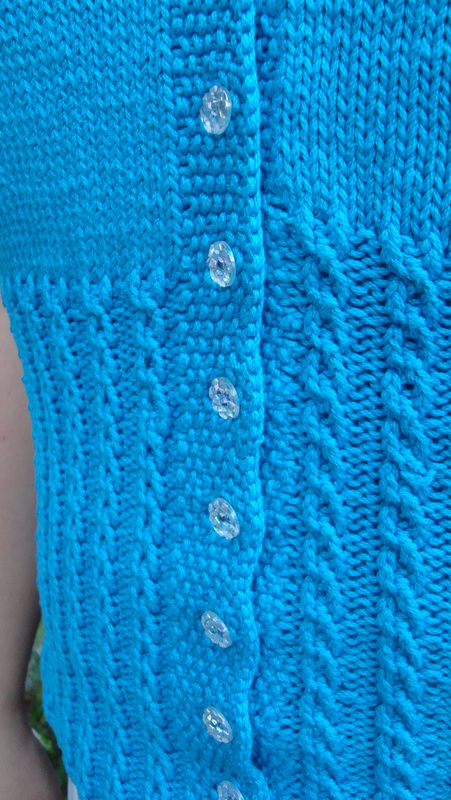 The yarn is currently $10 for a bag of 10 so knit one up for yourself soon! This entry was posted on Monday, September 26th, 2011 at 11:23 pm	and is filed under Uncategorized. You can follow any responses to this entry through the RSS 2.0 feed. Both comments and pings are currently closed.